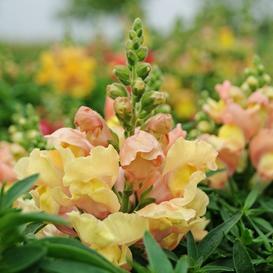 Familiar as a cut flower and a border plant, Snapdragon grow tall stalks with big, showy displays of unique flowers. Appleblossom Snapdragons feature a soft rose color and sturdy stems that are long lasting when cut. Highly attractive to bees and butterflies, they are a beneficial part of your garden as well as being pleasing to the eye.